Migration with all its causes and facettes is not a recent phenomenon: Brandenburg is a region of immigration. Since the beginnings in the Middle Ages, when a territorium with the name Brandenburg developed, its immigrants significantly shaped the country's history. First, German electors came as conquerers in the areas inhabited by Slavs. In the 12th century, mainly Christian immigrants from what is now West Germany, Belgium, and the Netherlands came. They settled in inhabited as well as uninhabitated regions, mixed with the local populations, founded cities and towns. In the past, mobility and migration were more common than generally assumed. In the time from the 16th century until the 18th century, half of the people in Europe at least changed their place of residents once. Often, migration was limited to a small geographical space, however, particularly in Brandenburg, immigration took place in large numbers, even from afar. This was mainly related to the repercussions of the Thirty Year's War (1618-1648) that led to a high loss of population, abandoned and deserted towns and desolated lands. The souvereigns strove to draw people through targeted settlement policy (Peuplierung) to Brandenburg. Thus they established the reputation of Brandenburg as a melting pot of different cultures and tolerant dominion, in which religious refugees found shelter. The most prominent example are the huguenots as well as the Lutheran Salzburger who found a new homeland in East Prussia. However, these are just two among many groups - migrants from Austria, Switzerland, Palatinate region, Bohemia, Silesia and the Netherlands also came to Brandenburg. The majority of the immigrants came from Europe. However, people from Africa and Asia also migrated to Brandenburg: as war prisoners, slaves, court servants, and soldiers. Indpedent of their origin or faith - Lutherans, Reformists, Catholics, Jews, or Muslims - their education or qualifications, reflexes and problems between the locals and immigrants repeated themselves in the course of history. What today counts as the country's success story, caused similar discussions about immigration and integration like today: fear of changes, the loss of jobs and sources of income, the feeling of foreign infiltration and loss of identity, the impression to be disadvantaged in favor of the newcomers. At the same time, the immigrants were fearful about their own future. This also accounts for the time after WWII, in which displaced people and refugees from the former German settlements in the East came to Brandenburg. They were officially called "resettlers" among which 140 000 stayed permanently. From a historical perspective, immigration in fact belongs to Brandenburg's identity and tradition. It is thus significant that the literary work that still shapes Brandenburg's image like no other and developed its identity, was written by the successory of migrants - Theodor Fontane's 'Hike through Mark Brandenburg'. Stadtplan von Potsdam mit seinen Erweiterungen bis 1797, Kupferstich von J. C. Frentzel, Aufnahme von Samuel von Suchodolez (1683), ergänzt von Friedrich Gottlieb Schadow © HBPGThe development of the state's present capital reflects Bradendenburg's history as a region of immigration impressively: The map shows the state of the city in 1683 with black coloured houses. 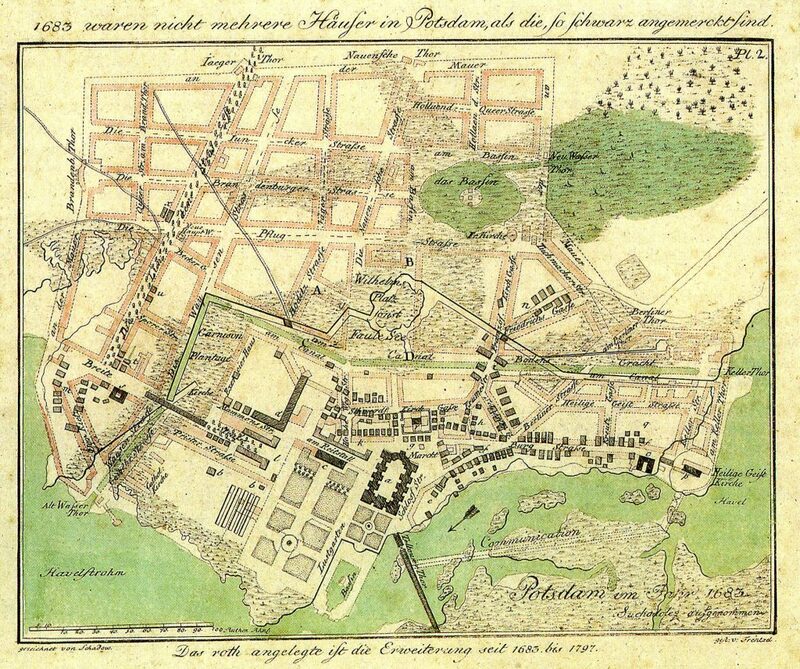 The red construction areas mark the expansion of the city until 1797. The unimpressive town had become a lively city, secondary residence for Brandenburg's electors andPrussian kings. Potsdam owes this development also its various immigrants, who inhabited completely new quaters of the city, like the Dutch. Moreover, Jews, Bohemians, Huguenots, court artists and servants as well as soldiers from Europe, Africa and Asia lived in the city. There were churches for the different Christian confessions, a synagogue and probably also a mosque for a short time, or rather a praying room for Mulims in the military orphanage.